These are some of the best bar cookies ever. A one-on-one aide I used to teach with made these every year around Thanksgiving. When I was leaving teaching I had to get the recipe from her and she gladly shared. 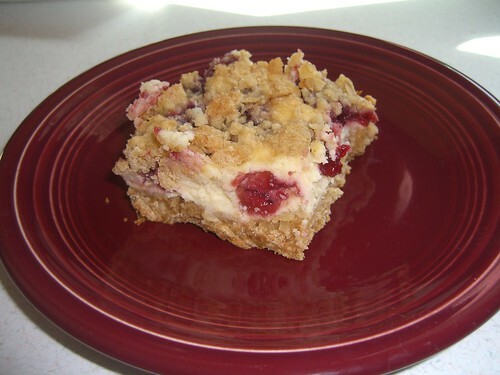 Trust me if you like a nice oatmeal, dense crust, cheesecake and a fruity bite you will love these! In a large mixing bowl stir together flour, oatmeal and brown sugar. Using a pastry blender cut in the butter until resembles coarse crumbs. Reserve 1 1/2 cups of the crumbs. Press remaining crumbs into greased 13X9 pan. Bake @350 degrees for 15 minutes. Meanwhile in the same bowl beat cream cheese and sugar on medium speed until light and fluffy. Beat in eggs, lemon juice, and vanilla. Spread over crust. Stir together corn starch and cranberry sauce; spoon carefully over cream cheese mixture. Sprinkle with reserved crumbs. Chill at least 3 hours. Cut into bars and enjoy.